We all begin a new venture, a new job, a dream, a new holiday by envisioning what the end result will be. We see success, relaxation, enjoyment and fun. What often happens is that the pursuit of the dream becomes tiresome, it starts to feel like a have to, rather than a want to and we begin to feel frustrated and disillusioned by the process of getting to where we want to be. Here’s the thing. 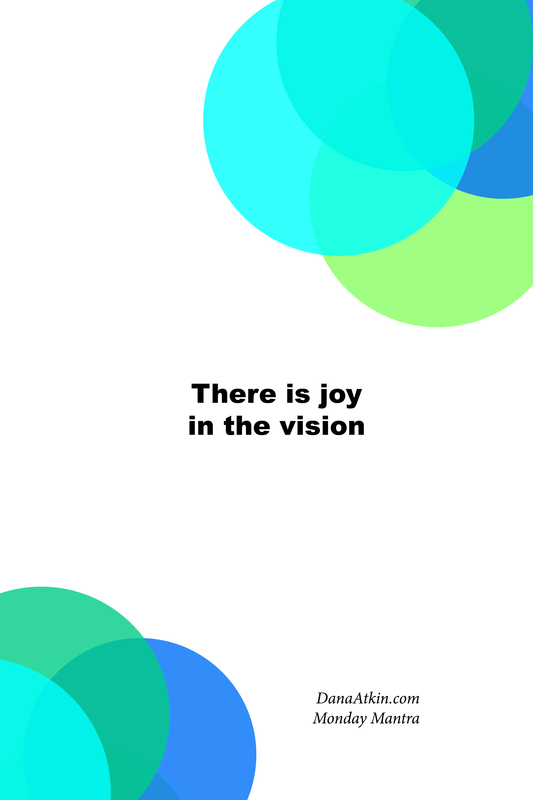 We forget that there is joy in the vision. We shift our focus on to the details (which does have to happen in order to make these things happen) and we forget to hold the vision of the result we’re looking to achieve. This is where vision boards are so handy. They remind us of the grand plan, the feelings, the experiences, the end result we’re striving to achieve. Today, I’m going to stop a few times throughout my day and imagine my vision and what it will feel like when I’m there. What’s one thing you can do for yourself today that will remind you of the joy in your vision? As always, download and save this Monday Mantra Image to your desktop or phone or print it and pin it somewhere you’ll see it. When you see it, say it. And if you know someone who would also benefit from this mantra, please share it. People are amazing. They can be so positive, so encouraging and supporting. Unfortunately, we tend to show this support to everyone around us, sometimes going above and beyond to show it and yet we do not offer the same compassion to ourselves. Instead, we talk down to ourselves, we say things to ourselves that we would not say to a friend who needed encouragement, we hold ourselves back from opportunities, we step away from self care, we beat ourselves up over situations that could not have been helped, we tell ourselves we could have done better, we tell ourselves that we should be doing something else, or we shouldn’t be doing something. We judge ourselves and belittle ourselves right when we need to be own best friend and offer words of encouragement and support. If we don’t support ourselves, if we don’t back ourselves, if we don’t believe in ourselves, then we reinforce the feelings like no-one supports us, no-one backs us and that no-one believes in us and eventually, the people around us will begin to prove our own perception. If you change your perception of yourself, begin supporting yourself, your abilities and believe in yourself, then eventually, the people around us will begin to prove that perception and support you too. I know which one I’d like to choose. I choose to support myself. Most people are unaware of the signs that surround them all day, every day. The universe is always trying to get out attention. Sometimes, it’s simply to say “hey, I’ve got your back” and sometimes it’s more of a “If you keep focusing on this, I’ll keep sending it your way” or even a “This is something you need to be aware of”. The form of signs is many and varied. They come to you in numbers, colours, shapes, animals, words and songs. The possibilities are endless. What characterises them as signs is their repetitiveness and consistency. Last week, on my into work, I had a small spider in the car. When I go into work, there 3 on my desk and when I got home, there was one on the lounge room floor. Because there were so many in such quick succession, all in the one day, I saw it as a sign and did some research on Spiders as animal totems. The week prior, I was finding feathers in random places, including one placed on my car windscreen even though it had been parked in a garage all day. I’m currently seeing the number sequence 808, EVERYWHERE! which is all about the manifestation of all that I need being supplied to be in abundance. (see Doreen Virtue’s Angel Numbers App for more information). I had last week, two separate people who do not know one another mention Teal Swan and Blessing their food in their own unique ways that felt right for them. These were not coincidences. For me, this is clear guidance from the universe telling me how to proceed. What signs have you been getting recently? How have you chosen to follow those signs? How do you read your signs? By reading the signs, we get a sense of interconnectedness with all of life and the universe, it makes us feel uplifted and as a result, we naturally attract a happier, more uplifting day into our lives. Today, choose to read the signs. It’s funny how we as humans fall into this trap of needing to prove ourselves. We work extra hours, we fret when we haven’t crossed anything off of our to do list (even when we’ve been running around doing things all day that relate to the “to do’s”) and we beat ourselves up if something doesn’t go to plan. I think perhaps that this is because on some level, we’re trying to prove to everyone else around us that we’re good enough to be doing that job or to be in that relationship. But there’s no point in proving this to others if we don’t believe it ourselves. Often, we want to prove it to others because deep down, we feel like we’re not good enough (regardless of how good we actually are). Sometimes, this pattern plays out even if we’re single or unemployed. If we think we’re not good enough, then the universe and other people will reflect that belief back to us. Here’s the thing though. We are all good enough. If we weren’t good enough, we wouldn’t be in that job or in that relationship so we are good enough. If you’re single, think about all the compliments you’ve received from friends, family and ex-partners – these are all more than good enough qualities to bring into a new relationship. If you’re currently unemployed, look at all the qualities and skills you’ve got listed on your resume. You put them there for a reason, usually because you feel like they are your skills and qualities – these are your “more than good enough” skills and attributes. I’m not saying that there’s never room for improvement but improvement needs a strong foundation to launch off of. Today, begin by trusting that the work you do, the love you give, the support you offer, the knowledge you have and that you are indeed enough. This Monday Mantra is influenced by a story that Caroline Myss tells of a woman and her husband. (I cannot remember the exact story, so I’ll give you the basic idea using what I can remember of the story). The gentleman was looking at their bank account and was concerned because according to their statement, they had nothing there. $0. All their savings were gone and there was literally no money left in their account. When he mentioned this to his wife, she said “Well, what about the trust fund?”. To which he replied that it had indeed all appeared to be gone. The wife then said “No, lets make some deposits into our TRUST fund. Let’s send out some positive thoughts and prayer and trust that this will all work out fine.” And it did. A few days later, all their money was returned into their accounts. It had been a bank error all along. The point is that sometimes, we can be so busy looking at the problem, over and over again until it becomes the dominating thought and eventually all the things that surround us are viewed from our pessimistic scope. But the moment we begin to start depositing and investing into our trust fund, trusting that everything will work out in the right timing for everyone involved is exactly when we begin to see the return on our investment. So, today make an effort to invest in your trust fund. You do this with today’s mantra as a beginning point. If you’re a creative or you just like the idea, create a jar for your trust fund. Instead of putting gratitude notes in, put in reasons why you trust that everything will work out fine. You could put in “I know that everything will work out fine because I’m getting signs from the universe that it will” or “I know everything will work out fine because it did last time” etc etc. Make it something meaningful for you. 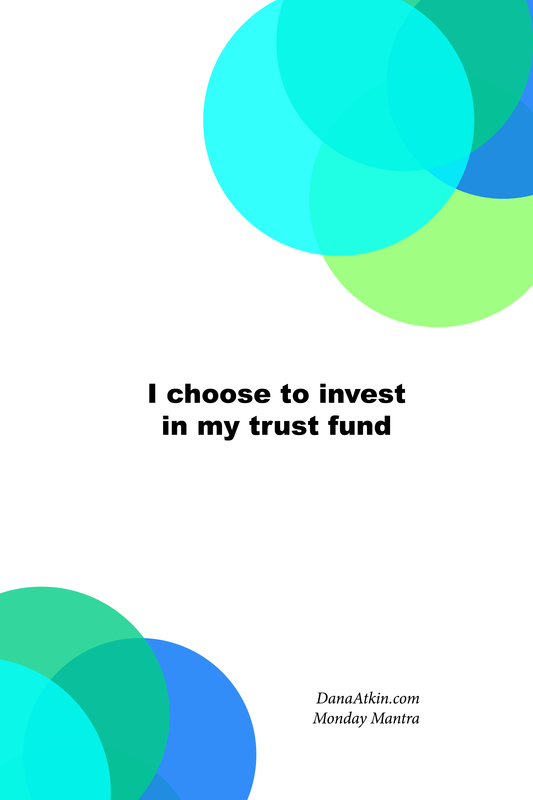 Choose to invest in your trust fund. This one is not an easy one for some. It’s not even an easy one for those who are well versed in listening to their inner voice. We tend to get off track and follow what others think and profess to be the “truth” or fact or the best way forward. When comes to our inner voice (i.e. ; Intuition, Inner Guide or Higher Self, Gut Instinct etc) we tend to allow other people to override it with their opinions because we worry that we might be wrong, that might be perceived as being “away with the fairies” or that because there seems to be no logic to it, we haven’t agonised over the decision enough, that the answer cannot be that simple. The thing is that the more we trust and follow this inner voice, the more it will guide us. I come across so many people who are easily swayed by the opinions of those around them. I am also quick to get my clients to tap into what works for them, not what I think they should be doing or what is right for them. The only person who knows what is right for them is themselves. The only person who knows what’s right for you, is you. So the next time you feel like you’re being pulled in many directions by the opinions of others, consider getting in touch with your Inner Voice and see what the best answer for you really is. Sit still, in a quiet space with your eyes closed, take a few deep breaths in and out and ask for guidance on the best way forward. It may come as a feeling, it may come as an instant thought of the best way forward or it may come later in the day or week as a series of signs (words, numbers, themes of conversation, “coincidences” etc). Choose to listen to your inner voice. Okay, so this mantra is all about being open. This one in particular is about being open to fun opportunities. I want new opportunities the year but I want them to be FUN! My personal word for the year is Fun. It’s all about infusing fun into life. What’s your word for the year? In order to infuse fun into life, I’ve realised (thanks to a 12 month year ahead oracle reading I did for myself) that I’m great at setting intentions but when it comes to being open and allowing myself to receive, I need more practice. What kinds of opportunities are you looking to invite into your life in 2015? So 2015 is very near. Like many people, I have begun to determine what I want from 2015. There are a few items that have been on my “to do” list for the last 12 months and there are others that have sprung to mind only very recently and I’m working on packaging them all up together to create an amazing 2015. The best way to get clear about what you want from 2015 is simply to grab a blank piece of paper & pen, a whiteboard & marker or a new, fresh Word document and begin typing. It doesn’t matter if it seems trivial, if you want it, write it. It doesn’t matter of it seems too far fetched, if you want it, write it down. Write out all the things you want, the places you want to see, the people you want to meet, the money you want to attract, the books you want to read, list it all. Of these, which are the most important to you? When you think about these, what else comes to mind about how you can achieve it? Write your most important items out and put them somewhere you’ll see them often. This will act as a reminder of what’s important to you in 2015. If something is going to draw you further away from these important things, then feel free to say “no” to the offer, request or invitation. If something is going to draw you closer to your important things, then shout “Yes!” to any request, invitation or offer that will draw you closer to your most important items for 2015. 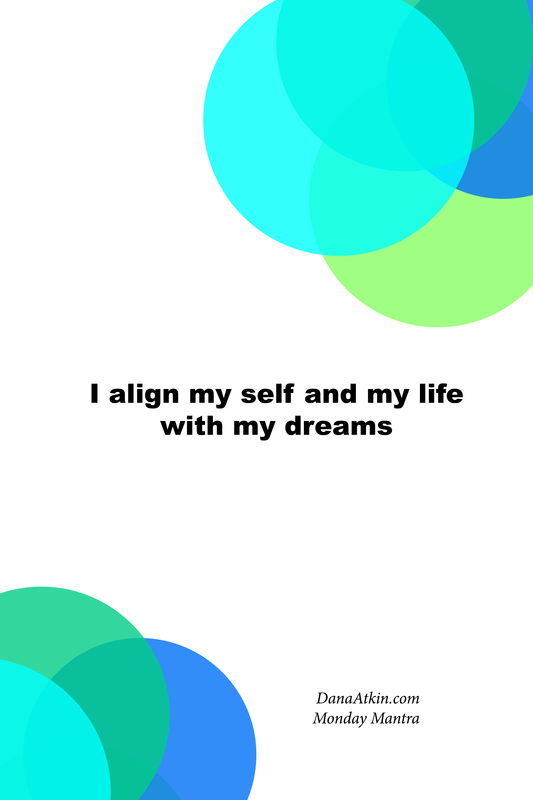 Align yourself and your life with your dreams and you’ll find it much more smoother sailing. As always, download and save to your desktop or phone or print it and pin it somewhere you’ll see it. When you see it, say it. And if you know someone who would also benefit from this mantra, please share it. Need more assistance in aligning yourself and your life with your dreams? Why not book a Kinesiology session and release some blocks that might be standing in your way. I find myself getting worked up at having to run here and there throughout November and December. I sometimes get frustrated at feeling like I am never home, feeling like people take advantage of the holiday season and use it for an excuse to drink and fill our calendars with social events we can’t fit into our schedules. When I’m at my peak of frustration though, it’s usually about then that I “give up” and just go with the flow and enjoy whichever social occasion I’m at. But to be honest, that “giving up” is not what it seems to be. It’s actually a choice to feel good about the situation and a choice I could have made much earlier on in the piece. The Human Super Power of Choice is one which gets forgotten way too quickly and way too easily. Everyone has the power to choose. What to wear today, which way to go to work, what to have for lunch etc. We also have the power to choose what kind of life we want, what career we would like and how we respond to what life sends our way. So, that means that you can choose to feel good while holiday shopping and you can choose to feel good while heading out to yet another holiday gathering. You can choose to not attend all of the social events. You can choose to attend them all. You can choose to do only the fun things if you wish. Change your holiday Have To’s into some Holiday Choose To’s today and see what difference it makes to your holiday season. Children have this knack of being themselves. When they’re happy, they are outwardly happy and joyous. When they’re sad, they cry. Somewhere between childhood and adulthood though, we’re taught to pretend that we’re okay, even if we’re not. We’re taught to be calm even when we’re happy. Often as adults, we find ourselves in not so great circumstances and we push through, pretending that we’re fine when we’re not and thinking that we have to hold ourselves together that we can’t be unwell or we can’t be upset because people will think less of us. We go to work when we’re sick even though we know it’s important to look after ourselves, we get it in our mind that a business is more important, that something or someone outside ourselves is more important than us and our own wellbeing?! The fact is that being vulnerable is actually okay. 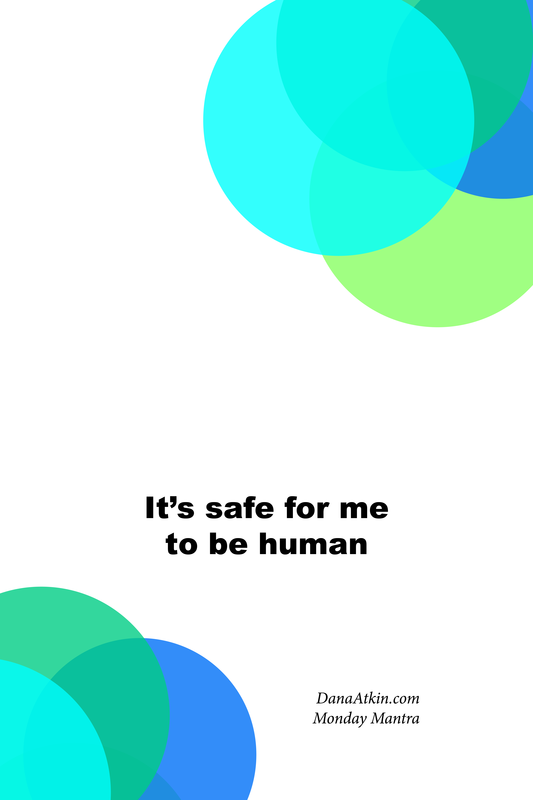 News flash: we’re all human. We’re not perfect because it’s in our nature to always be striving for more, so why deny ourselves of who we really are, our authentic selves? We’re all human. We laugh, we cry and sometimes we get sick and you know what, we don’t need to pretend we’re okay if we’re not, we can cry if we feel so inclined and we can certainly ask for help. Today, I want you to acknowledge your humanity and the humanity of those around you. Keep an eye out for those who seem to be keeping themselves, their true self at bay and encourage them to be themselves – lead by example.